Find a delicious jam using our customer satisfaction ratings. Canstar Blue research finalised in March 2016, published in May 2016. The results for 2016 are in, and we are pleased to announce that Anathoth Farm has been rated five stars for overall satisfaction and has received the award for Most Satisfied Customers – Jams & Preserves. Jam is one of those staple foods that can be found in every household, and it’s not hard to see why. After all, there’s no better way to start the day than with a generous helping of sweet jam on toast. Breakfast is the most important meal of the day, so you want to give yourself the best possible start. But what Jam has Kiwis looking forward to getting out of bed? 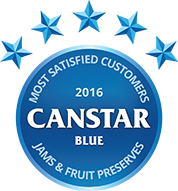 In an endeavour to find New Zealand’s favourite jam, Canstar Blue commissioned nationwide research, asking everyday Kiwis what they think about the jam they most recently enjoyed, or otherwise. The results for 2016 are in, and we are pleased to announce that Anathoth Farm has been rated five stars for overall satisfaction and has received the award for Most Satisfied Customers – Jams & Preserves. Unlike some of its competitors, Anathoth Farm says its jams are made with 50% fruit – with no added pectin, preservatives or artificial colours and flavours. While making jam this way can be a little more expensive, it appears to be paying off for Anathoth Farm as the only brand to also rate five stars on taste. As part of our research, we tried to settle the age-old debate – do you store jam in the fridge or the pantry? So long as you eat the jam within around six months, there is ordinarily no need to chill jam, as the fruit’s natural acidity helps inhibit the growth of any bacteria that might make you sick. Despite this, a decisive 71% of Kiwis say they prefer storing jam in the fridge. While there’s nothing wrong with this, it’s not necessary unless you don’t plan to eat it for some time – though of course you might just prefer cold jam. What do we want from our jam? Creating a widely loved jam is no easy task. As you might expect, taste was found to be the most significant driver of satisfaction. However, that’s only half the picture because other things are also important. Canstar Blue commissioned I-view to survey 2,500 New Zealand consumers across a range of categories to measure and track customer satisfaction. The outcomes reported are the results from customers who have purchased and eaten jam and fruit preserves (including marmalades) in the last three months– in this case, 1,540 New Zealanders. Dieting is fraught with food danger. Here are the five diet-destroying foods that I avoid at all costs.